Just a quick post - More just a personal musing from the real world relating back to a listed company. I guess you could say I am a curious investor and person in general watching for trends and new habits as they evolve and I find it interesting to see how they can potentially relate back to an investment case. As most know the years from 2002 - 2007 produced solid gains on both the equity markets and the property market in Australia. As a first home buyer myself in 2002 as a 21 year old following the purchase of my first home and in the years after witnessed first hand the boom of weekend warrior property renovators and on the Sunshine Coast also construction of new higher end waterfront unit blocks as well as commercial development and expansion. • Higgins Coatings paint the grass surface area equivalent to the MCG every 2 hours. • Higgins Coatings are the biggest user of Dulux Paint in Australia. • Higgins Coatings employ over 824 painters, sales people & admin staff nationally. Some research following this uncovered to me that Higgins is the largest customer of Dulux coatings in Australia. I am not going to go into the business numbers for Dulux in this post - My point is more the observation of what I noticed over a 6 month period and when you think about the lifetime of these paints/coatings we are now in a period 10 years plus post the massive Australian house and renovation boom of the 2000's when these buildings were last painted/coated. Will this period provide a period of increased exterior upgrades as body corporates, commercial investors etc take advantage of the lower rates and combined with timing give that coat of paint/render to improve the value of their property? How will this unfold for Dulux $DLX and the company's profits over the coming years? 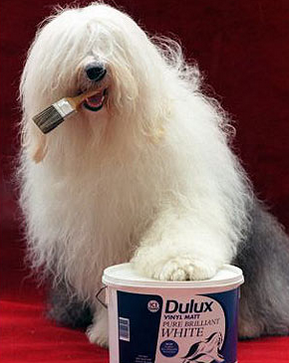 Also when you think of brand strength - Ask yourself which company you think of when you see a picture of an Old English Sheep dog? See Dulux share price chart below which has recently broken upwards from a longer term consolidation which seems to mirror the activity I have seen from their largest Australian customer. The author does not own shares in this company - This article is not a recommendation to buy or sell shares in this company. Newer PostBest reason ever for Director selling - Honesty is the best policy!